OK, this has to be one of the easiest cards I have made. But, I think it turned out very cute. Now I am more of a dog person and was on the fence about buying this set, but I liked the stamps so why not just get the bundle, right? Save 10%. You have probable seen several post on pinterest using the punch this way, so...here is my version. 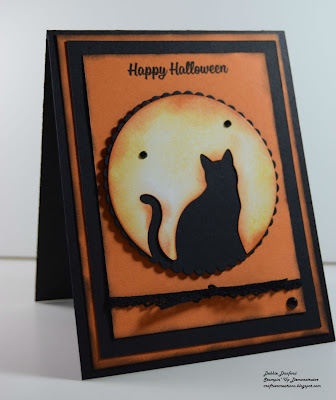 From the layering circles cut the largest out of Shimmer Paper and punch out the cat. Sponge with Crushed Curry and Pumpkin Pie. 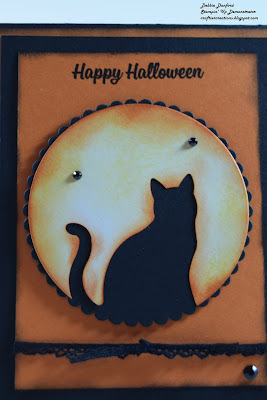 Die Cut the Scalloped Circle out of Basic Black and attach to Shimmer Paper. 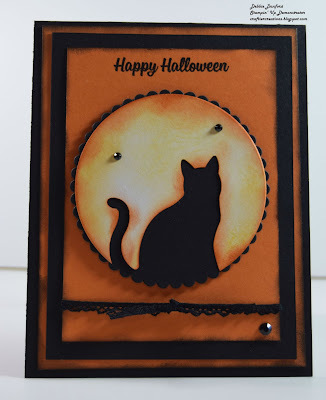 Daub Basic Black around the layers of Pumpkin Pie. On the top layer of Pumpkin Pie stamp phrase in Basic Black and attach Vintage Crochet Trim. Attach Dimensional's to Circles. Add Black Rhinestones.